The first inhabitants of Ohio were highly mobile hunters and gatherers. These people most likely moved as the seasons changed and different resources became available. There is little archeological evidence for Paleoindian occupation because these early peoples did not create permanent settlements and most likely traveled in small groups. Although the Paleoindian footprint on the landscape is light, archeologists have found stone tools that indicate where these people lived and hunted. One of the most spectacular Paleoindian finds in Ohio is the Burning Tree mastodon skeleton. Careful analysis of the bones indicates that Paleoindians killed and butchered the now extinct mammal. In the early 1990s, archeologists from the Cleveland Museum of Natural History excavated Paleoindian sites in Medina and Stark counties bringing important new insights into our understanding of the lives of these earliest Ohioans. Medina County's Paleo Crossing site, for instance, was a large meeting site dating back 11,000 years. Tools made of stone quarried in Indiana suggests that inhabitants may have been Ohio's earliest colonists. The Nobles Pond site in Stark County contains a similar, though much larger, congregation site. Archeologists found extensive use of fine Ohio flints at Nobles Pond. Paleoindian use of Ohio's flint prefigured its importance as a raw tool-making material and trade item for those who followed. 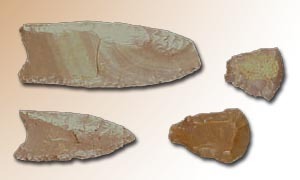 Paleoindian points and scrapers found in Ohio. Why was flint so important to early peoples of Ohio? Flint was important to prehistoric peoples because it is an excellent material for stone tools. Flint is a type of very fine-grained quartz. The microscopic crystalline structure of flint gives it a glass-like quality. Similar to glass, flint fractures into thin, sharp fragments. A skilled flint knapper can strike the flint in various ways to produce blades and other types of stone tools.